A British space company is in the process of finalising engine test preparations and setting up distillation equipment for its rocket oxidiser from a new workshop as it continues its journey towards launching satellites from UK soil. Edinburgh-based Skyrora has started its expansion into Cornwall Airport Newquay marking a significant milestone in its development and adding to the five workshops currently operated by the company. The move signals the start of testing for a revolutionary rocket engine which Skyrora has manufactured in conjunction with engineering firm Frazer Nash. Skyora director Daniel Smith said: “Last summer we selected Cornwall Airport Newquay as the ideal place to begin the test campaign for our upper stage engine and the continued enthusiasm we have received from the team has led us to explore other activities that we could perform in the hardened aircraft shelter. Skyrora’s deployment at Cornwall Airport Newquay is being supported by the Cornwall & Isles of Scilly Local Enterprise Partnership (LEP), through its Enterprise Zone Infrastructure Fund. 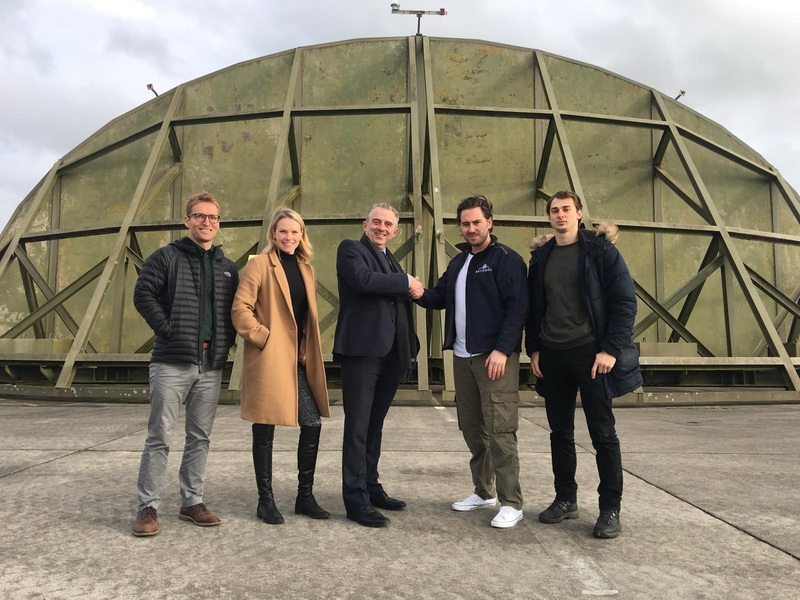 The airport is also home to the LEP-backed Spaceport Cornwall project, which aims to be the first horizontal satellite launch location in the UK. The engine tests will focus on Skyrora’s upper stage motor, the engine that will power and manoeuvre the payloads once they have reached orbit, a particularly innovative operation that is made possible through the company’s choice of hydrogen peroxide as an oxidiser. A key requirement will be to find out how the engines respond to regular restarting with the developer on track to produce rockets that allow for the launch of individual satellites into different orbits from a single launch. LEP Chief Executive Glenn Caplin said: “Our ambition is to create a £1 billion space economy in Cornwall by 2030 and we’re delighted to be hosting such an important part of Skyrora’s research and development programme as the UK moves towards launches from home soil at a Spaceport in Cornwall. What differentiates Skyrora’s engines is the use of easily stored hydrogen peroxide and kerosene as a propellant as opposed to cryogenics such as liquid oxygen, to create rockets that are best suited to the changeable weather conditions of northern Scotland which could potentially result in rockets being held for long periods on launch pads. The company’s expansion has corresponded with further appointments to Skyrora’s fast-growing team, with a further chemistry engineer to be stationed at the Newquay site as well as an assisting intern – a position created through a grant from the UK Space Agency. A team of ten will be on site during the engine testing programme, which will take place inside one of the hardened aircraft shelters at the airport. Skyrora expect the tests to take around four weeks with additional time on site for education outreach, working with schools and colleges to inspire the next generation about space opportunities in Cornwall. As part of that commitment, the physical engine has been designed by Skyrora engineers and manufactured by Hampshire firm, Fraser Nash, using the latest innovations in 3D-printing to produce the nickel alloy rocket engine components. As well as this, it has been working with Westcott-based European Astrotech to build a bespoke hydrogen peroxide distillation plant. Skyrora aims to capture its share of the fast-growing small satellite launch market and is developing launch vehicle technology that builds on previous rocket systems with the aim of reducing the cost of launches thanks to proven technology and advanced engineering methods. The company started its developmental launch programme in August with the Skylark Nano and will continue with two planned launches in early 2019, with its Skylark Micro and SkyHy vehicles already built and ready to launch. The Skyrora XL vehicle is on track to become the first British rocket to launch into orbit – and draws parallels with the original UK orbital rocket, Black Arrow, through the proven combination of kerosene and hydrogen peroxide as a fuel source. Skyrora is developing launch vehicle technology that builds on previous rocket systems including Skylark and Black Arrow, with the aim of reducing the cost of launches thanks to proven technology and advanced engineering methods.